ActioNet’s corporate culture is based on our commitment to our clients, our people, and growth, which has helped us reach new levels as an organization. We are never satisfied with the status quo, having achieved the most current SEI CMMI®-DEV Maturity Level 3, ISO 9001:2008, ISO 20000 and ISO 27000 in the past few years. Our results-driven team delivers high quality IT solutions to our clients through proven methodologies and innovation. 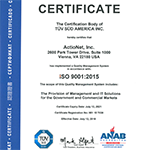 Further demonstrating ActioNet’s commitment to continual improvement and excellence we became ISO/IEC 20000 certified in 2011. 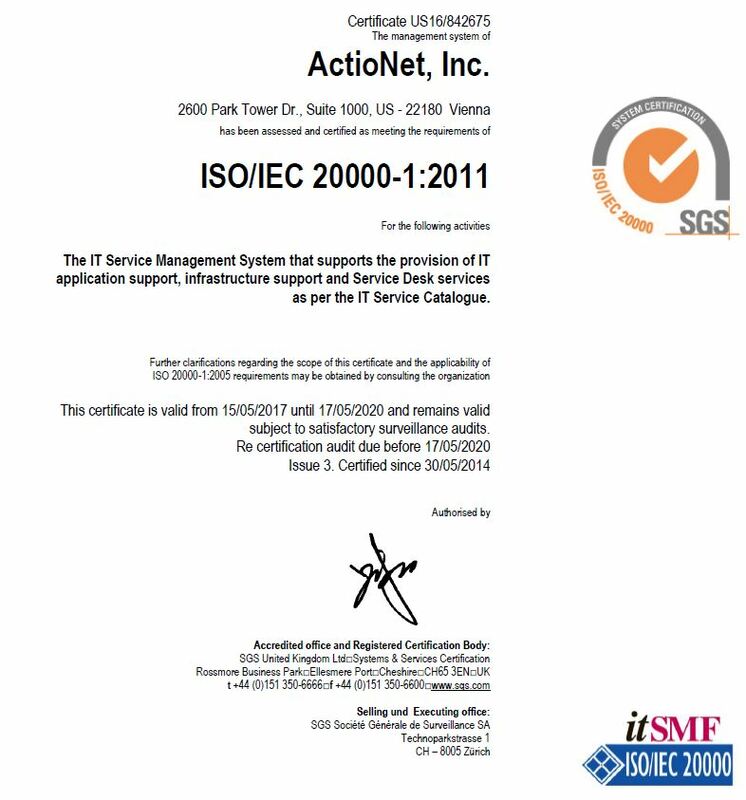 Based on industry recognized ITIL best practices, the ISO/IEC 20000 standard focuses on providing the highest level of IT Service Management to customers, reinforcing ActioNet’s dedication to providing world class services to our customers. We received our certification on May 30, 2011 and look towards our next challenge in our relentless pursuit of continual improvement to find ways to provide service and value to our customers. 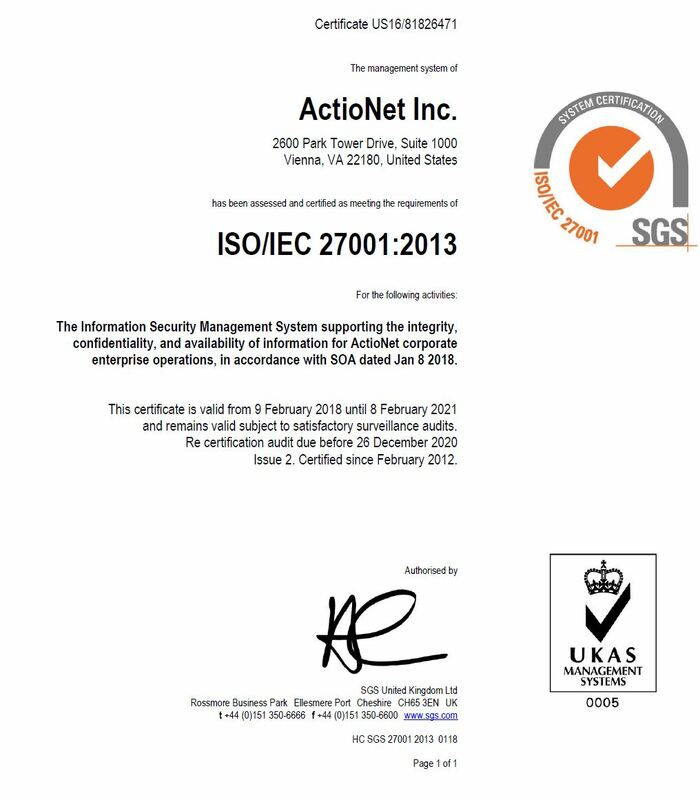 ActioNet Inc. has successfully certified against the ISO/IEC 27000 standard. 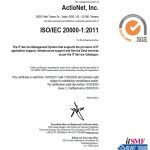 Maintaining an enterprise level Information Security Management System (ISMS) is a critical component of ActioNet’s IT infrastructure. 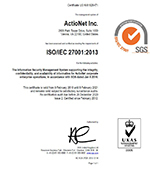 By obtaining the coveted ISO 27000 certification ActioNet emphasizes its expertise in Information Security and Assurance as well as demonstrating its strengths in Risk Management. ActioNet doesn’t take a break from quality. 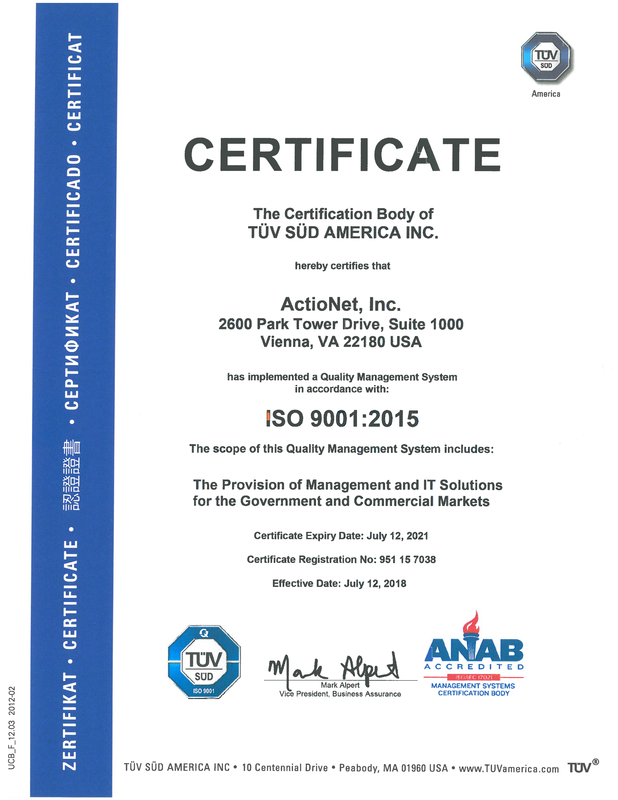 We were first certified against the ISO 9001:2000 standard in 2006. As part of our continuous improvement model, ActioNet began gearing up immediately for our annual internal assessment interviews followed by managing logistics for our ISO 9000 recertification audit against the revised 2015 version of the standard, ISO 9001:2015. We have accomplished recertification against this standard in 2009, 2012, 2015 and, most recently, July 12, 2018 with several noted strengths by the external auditor. This history of commitment to quality management and engagement represents an ongoing ActioNet success. 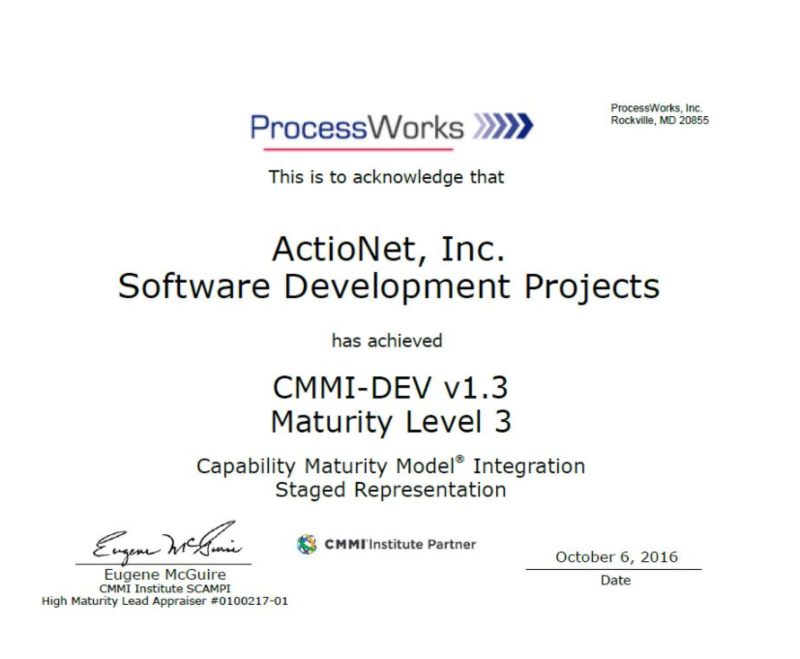 ActioNet started on our path to process improvement certifications in 2003 when we were externally assessed for CMM Level 3 for software. Since then we’ve progressed through several versions including CMMI® SE/SW on July 15, 2005, CMMI-DEV v1.2 on May 9, 2008, and CMMI-DEV v1.3 on April 8, 2011. 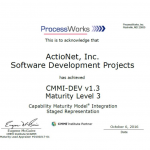 Our most recent appraisal was completed on October 6, 2016, when ActioNet, Inc. was again externally assessed by ProcessWorks, Inc. at Maturity Level 3 of the Capability Maturity Model Integration (CMMI) v1.3 for Development (DEV). 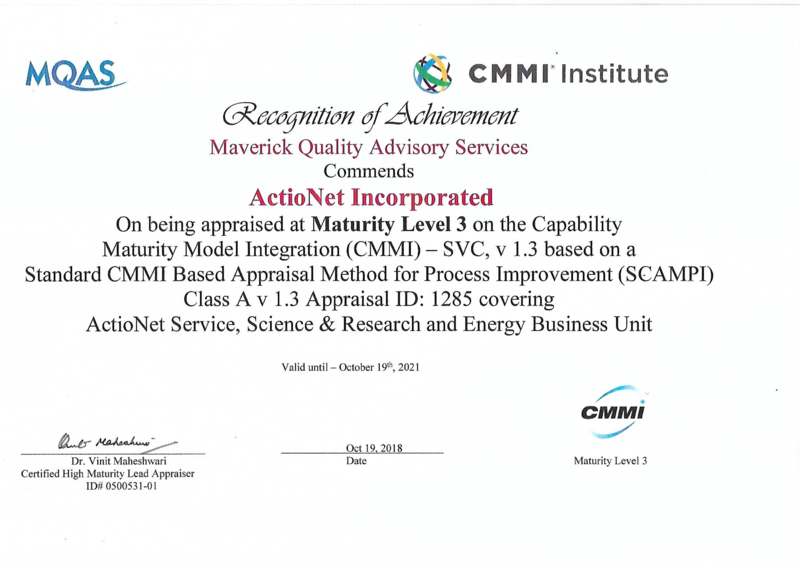 Developed by the Software Engineering Institute (SEI) at Carnegie-Mellon University (CMU) and currently owned by the CMMI Institute, CMMI-DEV v1.3 is a process improvement model for the development of products and services, implementing best practices throughout the lifecycle. 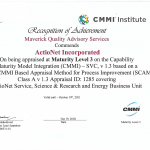 CMMI Maturity Level 3, or the “defined” level, is focused on process standardization. This rating is granted only after a rigorous audit by a third-party appraisal team. ActioNet’s corporate culture is based on our commitment to our clients, our people, and growth, which has helped us reach new levels as an organization. We are never satisfied with the status quo, having achieved and continually improved the most current SEI CMMI®-SVC Level 3, SEI CMMI®-DEV Level 3, ISO 9000, ISO 20000 and ISO 27000 in the past few years. Our results-driven team delivers high quality IT solutions to our clients through proven methodologies and innovation. 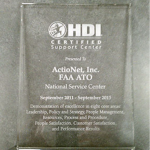 ActioNet has joined the select list of approximately 25 companies worldwide who have received the HDI Support Center Certification. This program is the only open industry standards program for the certification of support center quality. HDI Support Center Certification is designed to improve the effectiveness of the support services industry and support organizations by providing an industry standard that is recognized worldwide, and an accompanying certification program. Evaluation is based on a set of activities, each with four levels of maturity used to evaluate the support center. 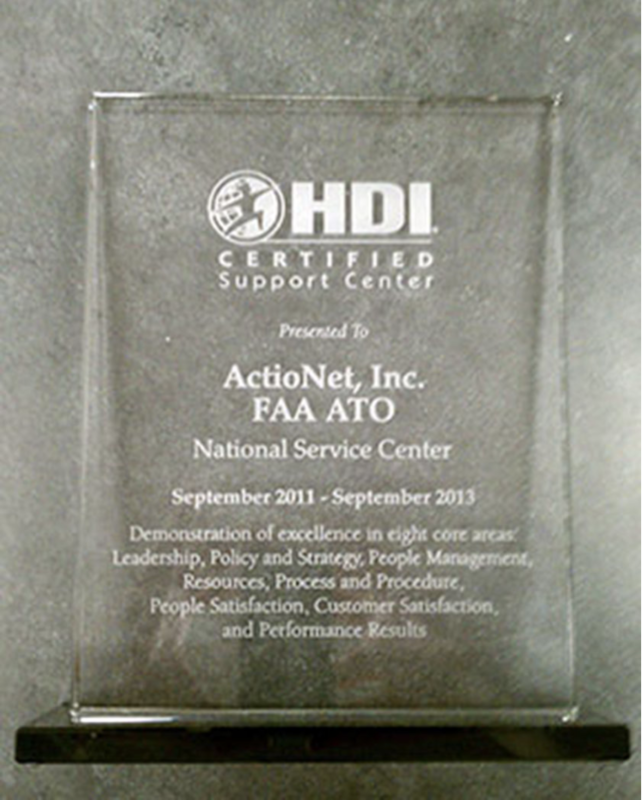 To become an HDI Certified Support Center, a support center must achieve minimum scores as defined by the HDI International Certification Standards Committee. 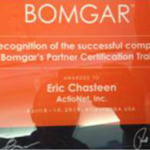 ActioNet is a certified reseller and services partner for Bomgar, a leading provider of secure remote service desk support solutions. ActioNet’s Remedy Practice has certified reseller and services representatives and administrators to provide re-sales, sales and production install and configuration support. Bomgar provides enterprise remote support solutions that enable support technicians to securely access nearly any computer or mobile device, regardless of location, language or operating system. With Bomgar, ActioNet customers now have access to a secure remote support solution that is integrated with many leading service desk platforms. Bomgar not only eliminates the need for on-site tech support visits, it significantly improves first call resolution, agent productivity and customer satisfaction.